From the accountant’s point of view he is right. 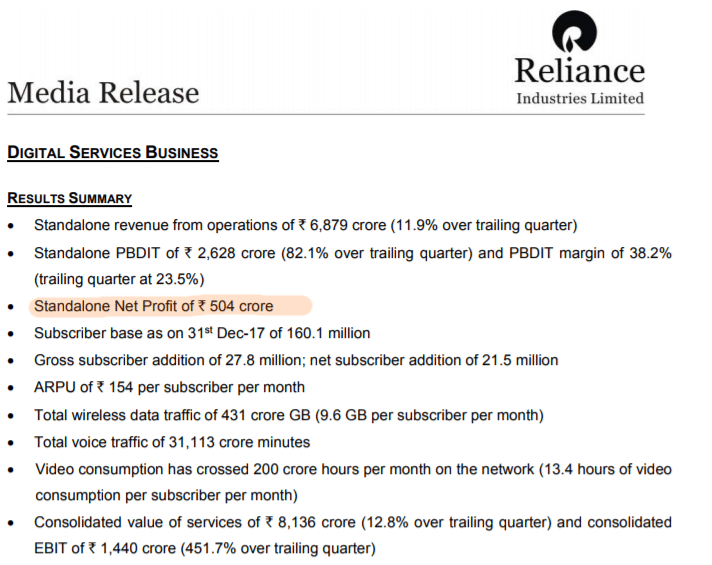 But as an investor, is Reliance Industries actually making a profit on the Jio investment? Here’s a look at the accounting. And Jio itself has borrowed only about 40,000 cr. 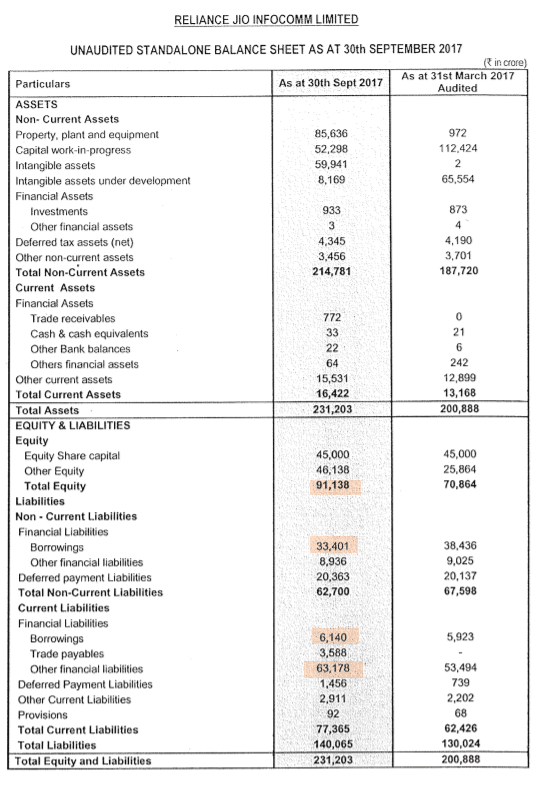 – half of this is in non-convertible debentures at 8.5%+ and some are bank loans. Note here that they’ve made a profit of over Rs. 2600 cr. before depreciation, interest and tax. We’ll come to that later, but the interest cost is just Rs. 660 cr. for the quarter. On a project deemed to have cost more than 140,000 cr, how come the interest is so low? Because the 91,000 cr. that has been put into Jio is money from Reliance Industries. It’s equity. So Jio doesn’t have to pay it back, or pay interest on it. But Reliance itself, at a consolidated level, has to pay that interest, which it probably gets at 7% rate, which means it has to pay s. 6500 cr. per year for loans taken to fund Jio. Or, Rs. 1,600 cr. 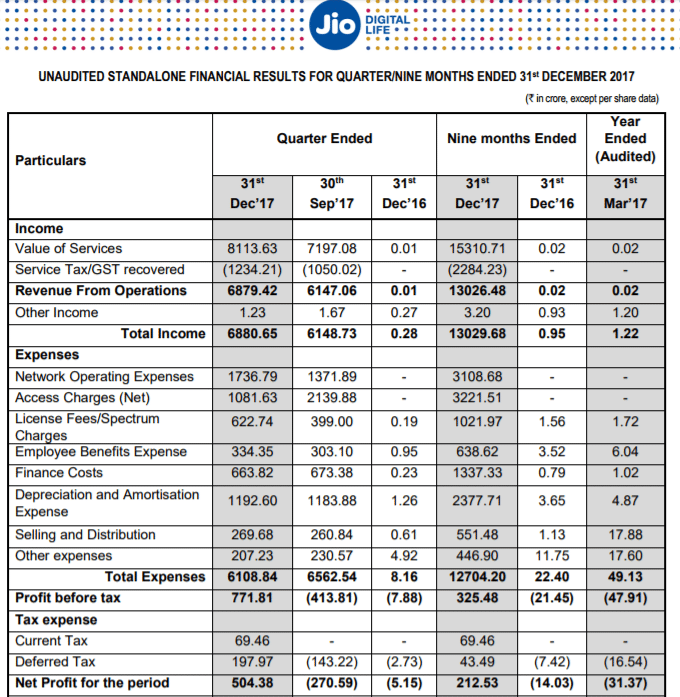 per quarter is what Reliance industries is paying to own the stake in Jio. Jio doesn’t have to care about this. It can merrily show the profit it does, since Reliance has to pay the bill for equity investments anyhow. If you consider, from Reliance’s angle, that the cost of the Jio project should include the interest being paid even for the equity, then the interest component will increase by Rs. 1600 cr. and that will offset all of the post depreciation cost they have. Meaning, if you include this cost of borrowing for Reliance, the project itself isn’t profitable. Or maybe you can consider that Reliance Jio can pay its parent enough dividends to cover, at the very least, the interest costs on such loans. To generate that much, Jio would need a profit of around 1500 cr. per quarter and it’s not there yet. And Reliance Jio uses a novel way to address depreciation. Since most of the expenses were pre-operative, they all sit on the balance sheet as assets that must be depreciated after the project goes live. It went live on July 1, 2017. So they would need to depreciate their stuff by about 7% a year, you might imagine. They have about 144,000 cr. in property, plant, equipment and intangibles. at 7% a year, it would be Rs. 10,000 cr. a year or about 2,500 cr. per quarter. But Jio shows only 1,200 cr. of depreciation, around half of what you might have calculated. Amortization of Spectrum Fees and Depreciation on wireless telecommunications equipment and components is determined based on the expected pattern of consumption of the expected future economic benefits, in accordance with the applicable Accounting Standards. Basically, they figure out how much their equipment can be utilized in future, how much they could charge, and the life of the equipment or spectrum fees. And accordingly, they put a depreciation value to the current quarter. So if I determine I could have 50 cr. users in the same spectrum and equipment and I determine they could give me Rs. 200 per month for say 16 quarters, that’s Rs. 160,000 cr. of economic value I could get. If I only got revenue of 154 per month for 16 cr. subscribers, that’s about 6800 cr. which is only 4% of my total expected revenue, so I charge depreciation on only 4% of my assets. The downside: Their expectation calculations are not known. If the equipment they have must be replaced (or becomes obsolete) before the expected time, or subscribers don’t ramp up to that level, then the depreciation calculations will be wrong, but we will know only in hindsight. So there is an incentive for them to make lofty assumptions and then charge lower depreciation. In good faith, the company should make public the assumptions so we can estimate how close they are to it later; but this is India and no one cares. An article by Quint also reveals more accounting changes. 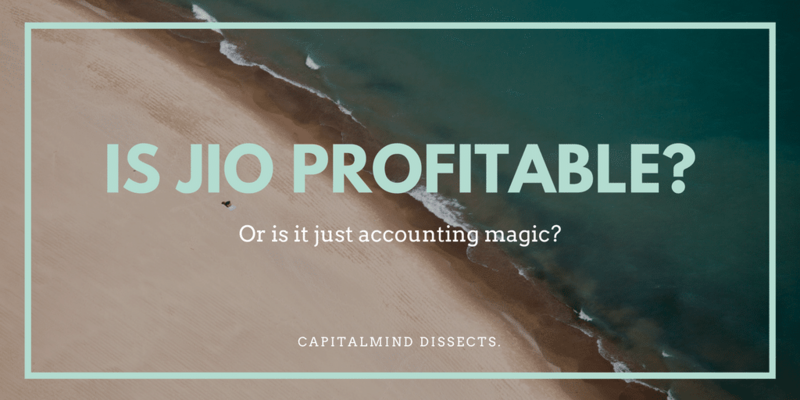 All in all, in my book, the Reliance Jio “profit” is a legal way to describe what seems to be a positive number on accounting sheet. But when you read between the lines, it’s not quite there yet. Jio changed the data market and it’s likely that much of their future revenue comes from content, not from data charges, as they’ve spent a lot to own it. Their ability to monetize and continue the current subscriber base will help. They’ll buy a good chunk of RCOM assets that had been put on sale. They haven’t revealed what they will pay for it, but that will further increase their need for cash. The competition seems to have caught up – at least in Mumbai, Delhi and Bangalore, connection speeds on other networks seem to have caught up, and plans are competitive. This might crimp the competition’s profit, but it pushes Reliance Jio’s “real” profitability further down the road. Our view: As a disclosure, Capitalmind Premium has recommended Reliance in our portfolios. In general our view is positive on the long term nature of the company, especially the scale of Jio and the growth in the Petchem business. But at the moment, it seems like Jio will have to be valued at more than 200,000 cr. for it to be a viable investment by Reliance Industries, and that value is still a while away. Jio has a lot of potential, given that it straddles data access, speed, content and commence. It remains the strongest balance sheet among the telcos, and the questionable profit today might be less questionable if it executes well. Note: The above accounting is legal. Perfectly legal. And many of you have taken the view that if it’s legal, it’s ok. This post is not for you. Many people have also started bashing Reliance for “manipulation”. There are different ways to account for things, but nothing in there is illegal. And we are actually quite positive on the long term nature of this company, but it doesn’t mean we’ll take anything it says at face value. The idea is to know and to make decisions appropriately; it is not to give “integrity certificates” or take them away. In the markets and in life, you will work with people who may not have the absolutely highest standards of integrity in your book, but they will still be excellent to work with.